When we got married, we'd been together for more than ten years. Relatives flew in from as far away as New Zealand, England and Belgium, as well as less exotic Florida, Ohio and Tennessee. (Nicole's parents generously fed, housed and transported most of them all week, in addition to doing so much else for the wedding). We were thrilled to have three grandmothers in attendance—ages one hundred, ninety-six and ninety-four. Friends (include one who was eight months pregnant!) traveled in from all over the country, too. Like most other 30-somethings getting married in NYC in 2014, we wanted our wedding to be very personal and to keep only the traditions that felt meaningful to us. (See this article from The Onion for more on this.) As we walked down the aisle, our friend Lawrence Kim played guitar and sang Woody Guthrie’s “Hesitating Beauty.” Rose Nestler, who we’ve known almost as long as we’ve known each other, got ordained in order to marry us. During our ceremony, two of our respective oldest friends, Kim Arcidiacono and Josh Weinstein, read selections from the love letters of mid-century art and design power couple Eero and Aline Saarinen. Our DJ was a pro, but a friend, too—the incomparable James Mulry. He worked with us to put together the perfect set for every part of the evening and helped immeasurably with decorations and organization. He even gave a beautiful toast! Because Dan is a letterpress printer, the printed matter for our wedding was more important to us than almost anything else. He designed and printed, with help from Nick Hurd, our save-the-dates and invitations, the neat coasters we used as place cards, the dinner menus and more at his shop, Sheffield Product. Almost everything he printed did double-duty as décor at the event. The industrial feel of the fourth floor of the Metropolitan Building really suited our design aesthetic and looked great with our bright yellow decorations. Rather than have a cake, we borrowed a tradition from one of our favorite cities, Pittsburgh, and had a cookie table for dessert. Guests brought their own specialties, ranging from Nicole's brother’s passion fruit mini-cupcakes to traditional sweets like mondel bread and Mexican Wedding Cookies to Dan’s mother’s famous poppy seed cake and his sister Jamie’s even more famous marshmallows to our friends Debbi and Jill’s amazing, hilarious Pantonuts (donuts decorated with Pantone colors). From the moment we started planning our wedding, we wanted a neon sign. 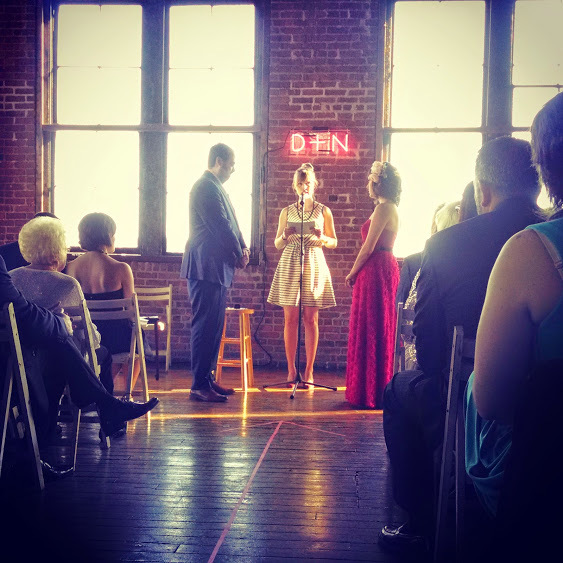 Roger Borg at 419 Neon made us our pink D+N sign, which we said our vows under, and which now hangs in our living room, a rosy, glowing reminder of our wedding day.